Before the recent financial crisis, both regulators and market participants disregarded the complex and dangerous nature of the relationship between prime brokers (the banks) and their clients (the funds). 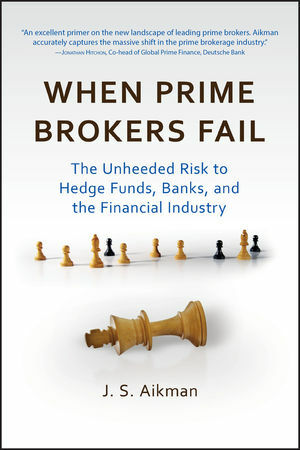 In When Prime Brokers Fail, J. S. Aikman examines the convoluted structure of this relationship, the main participants, and the impact of the near collapse of prime brokerages on the financial world. Filled with in-depth insights and expert advice, When Prime Brokers Fail takes a close look at the unheeded risks of prime finance and lays out the steps required for managers to protect their funds and bankers to protect their brokerages. Engaging and informative, this timely book details the intricacies and interdependencies of prime brokerages and the role that these operations play in our increasingly dynamic financial system. J. S. AIKMAN is a management consultant and lawyer advising managers and financial institutions. He also lectures on hedge funds and investment banking at the University of Toronto. Previously VP and counsel for a bulge-bracket investment bank in London, Aikman has broad international experience in alternative investments and has served as adviser to many successful entrepreneurial ventures. Aikman completed his MBA at Oxford University. He may be reached at ja@jsaikman.com.